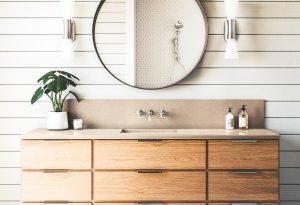 Must-Have Bathroom Trends for This Spring | Reborn Cabinets Inc. If you’re looking to update your bathroom this spring then look no further. We’ve got you covered! Here are the Top 3 must-have spring trends. If you are considering remodeling the bathroom in your forever home, this year’s most popular bathroom trend is the Floor-to-Ceiling Shower Glass Enclosure. Plus it’s a pretty hip way to go. This trend will make your bathroom look super tall, visually seamless and extremely unique. For us here at Reborn, putting this look in your bathroom is a no-brainer. Are you daring enough to try the “No Shower Dam”? It is exactly what it sounds like – a large shower with no shower door; it is completely open. You’re probably wondering if water will get everywhere. The answer is no. The shower floor slopes down toward a linear drain. Having a linear drain is the most particular way to go because it will keep all the water from getting into the bathroom area. Are you daring enough to do it! You’ll be happy you did! Floating vanities are the hip and trendiest thing right now. First of all, a floating vanity is much easier to clean than a standing vanity. It is so easy to get underneath and clean all the tough spots you usually cannot get to. Plus, having one of these floating vanities will make your bathroom modern and chic. This spring, give your bathroom a fresh, vibrant look with these stylish shower and vanity ideas. It’s a great time to change it up to be chic and modern at the same time.